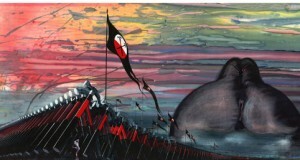 On Friday 16th June at 7 pm Gerald Scarfe will be giving a talk at the V & A Museum in London on his varied career and in particular his collaboration with Pink Floyd on The Wall stage shows and film. The talk is part of the V & A celebration of Pink Floyd, with their exhibition, Their Mortal Remains, running during May and June (three Gerald Scarfe works form part of the exhibition). For tickets to this event contact the V & A box office.